Last chance! 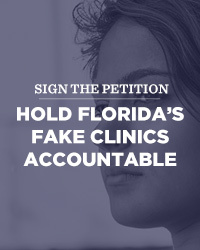 Hold Florida's fake clinics accountable. The Progress Florida team is heading to the State Capitol next week to deliver petitions to Gov. Rick Scott and the Secretary of the Florida Dept. of Health (DOH). There, we will join allies to call on the Dept. of Health to act on an important reproductive rights issue - the indefensible legitimization of anti-abortion, fake women’s health centers by a new Florida law that went into effect on July 1st. Take this LAST CHANCE to add your voice. Help us hold fake clinics accountable. Sign our petition to the Florida Department of Health demanding strict regulation of these fake clinics. Thanks to a new law that went into effect on July 1, our taxpayer money - to the tune of $4,000,000 a year - is now being funneled from the State Dept. of Health to more than 100 fake women’s health centers across our state. Until this appropriation is reversed by a future governor and legislature, we are calling on DOH to ensure those fake clinics fully comply with contract requirements including no use of taxpayer money to provide fake facts about reproductive health to women they’ve lured into their facility. More than 190 anti-abortion, fake women’s health centers operate in Florida. These fake clinics like to be called “crisis pregnancy centers” and often disguise themselves as legitimate women’s health care facilities. Fake clinics use deceptive, manipulative practices to shame women out of getting birth control and abortion care, diverting women from accessing comprehensive and timely care from appropriately trained and licensed medical providers. Women facing unintended pregnancies go to these centers, tricked into thinking they are going to get real medical care and unbiased counseling. Instead, they get false or misleading information about what services are offered, they are denied needed referrals for reproductive health care, and they are shamed for considering abortion. Sign our petition today and urge DOH to hold fake clinics’ feet to the fire in meeting their contract requirements. Thanks for all you do to fight for reproductive freedom throughout our state. PS: If you or someone you know has had a bad experience at a fake women’s health center and you or they are willing to share the story publicly (anonymously is fine) please contact me at amy@progressflorida.org. Thank you.